Perfect family ski end unit Condo with just 2 miles away from the base of Stratton. There are 4 bedrooms, 3 full baths and a family room that can be use as a bedroom that has a pull out couch or air mattress, great room to also use it as a playroom while adults can enjoy some time in the living room by the fireplace. Sleeps 12 or more comfortably. Level 1 (Lower level) has 2 bedrooms. 1 with bunk beds and the second bedroom has a Full size bed. Bathroom in the hallway with washer and Dryer machine. It also has another room that can be use as a bedroom, playroom, or just for an extra room for entertainment. Level 2 open space - Kitchen with dining table for 6, on the same level is the living room with fireplace, also Outdoor patio by the kitchen with a cooking grill and a balcony by the living room. Level 3. MB bedroom with Bathroom and a king size bed. 2nd bedroom has a queen size bed and 2 twin bed. A full bathroom in the hallway. Well suited for my groups needs. Comfortable and convenient to Stratton Mountain Resort. The owner was very supportive and flexible with a later check out request. Great place. Very cozy and there is a resident owl that hangs out on the balcony! Thanks for the great place. We all enjoyed it! Excellent place for winter vacation. Close to the ski base, perfect for a group of 12. We have a good time. Manager very helpful. Yes, will rent again. Loved the house - plenty of beds and bedrooms for everyone! 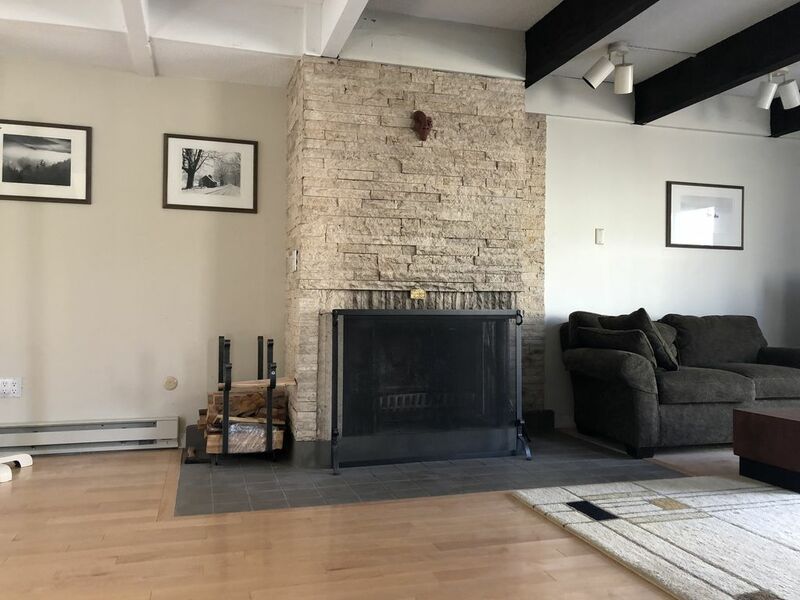 The main floor is open with a great fireplace and hang out area. Conveniently located off the Stratton Mountain Access Road - maybe 5 mins to the mountain. Had a blast, would book again! The place was perfect for a group of twelve family and friends. It was cozy, comfortable, and conveniently close to the lifts. Condo looked modern and the place had a dishwasher, laundry machine, wifi, smart tv, and a fireplace although we didn’t get a chance to use it. The property manager was nice and gave us instructions that were easy to follow. Overall had a great snowboarding trip. Rented this condo this past weekend and everyone had a great time. The property is perfect for a weekend ski getaway, perfect location and easy access. The drive to Stratton mountain is less than 5 minutes away. The condo was in great condition when we arrived and we left it the same way. Plenty of space for everyone to spread out. Pretty much like staying the weekend at your own home. They had everything one could need and the owner was extremely responsive and helpful the entire time. Overall great time. Will definitely be back. Thanks again. Glad you all had a good time! Looking forward to having you back anytime.